St. Louis, MO | In today’s fast-changing business landscape, it’s not your competitors that threaten your company’s survival. It’s your organization’s willingness and capacity to disrupt its existing business model or be disrupted. Because the CIO is at the center of the digital transformation journey she or he is uniquely positioned to deliver fearless leadership, fuse emerging technologies with process redesign and people skills, partner with the C-suite and board of directors, and successfully navigate the business into the future. The courageous leadership traits needed to foster a culture of innovation and transformation on the path to genius will be the focal point of the CIO Executive Leadership Series. HMG Strategy’s CIO Executive Leadership Summits are designed based on feedback from our Advisory Board members on the critical trends that are shaping the agenda for today’s technology executive. 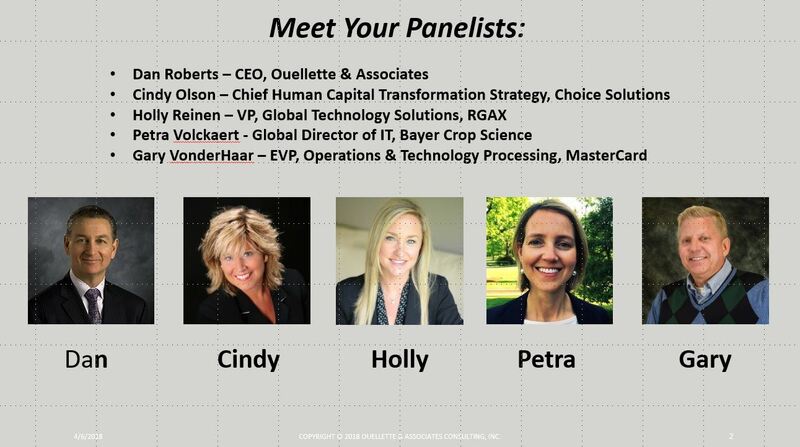 It is an honor to have one of our team members selected to be on the Panel of this CIO Executive Leadership Summit.